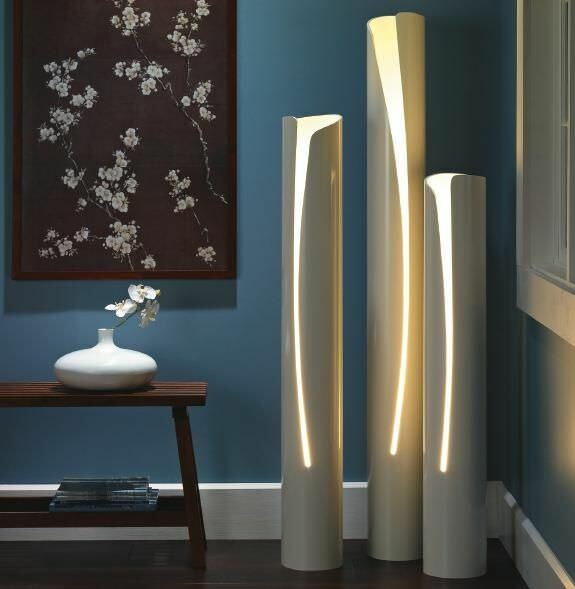 PVC is one of those inexpensive construction materials that is easy to cut, paint, drill, glue and create with. You can purchase straight tubes of different sizes, and matching connectors as well. Whether it’s to create a cool storage unit, or just something pretty, this is a great material for the beginning DIY’er to use. We got inspired by a PVC hair dryer / curling iron holder we spied on Pinterest, and put together this quick PVC project for all of you to help you corral that bathroom chaos! Then, since we got so jazzed about the idea of using PVC, we found some more DIY PVC projects for all around the home! Let’s start with our PVC project- A hair dryer stand. This project is so easy, it really doesn’t even need a tutorial! We picked up a PVC “y” connector at Home Depot, painted it with a spray paint / primer combo, and glued some fishing weights to the inside bottom to keep it stable. Try “Gorilla Glue” for a good hold on the weights. Done! Since we made this we’ve seen something like it mounted on the inside of the vanity cabinet door… Genius! This was our original DIY PVC project inspiration from Pinterest. Ok, now a bunch more great PVC projects for you to try! 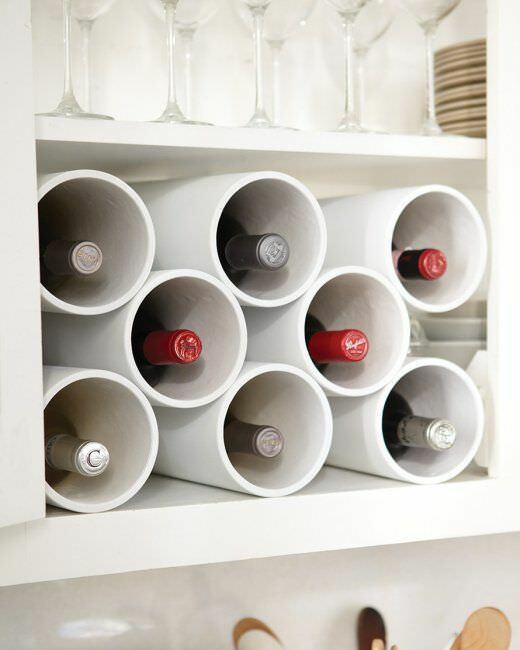 From ‘Martha‘, this PVC modern wine rack is an easy afternoon project, and can fit into an existing cabinet. Easy directions. 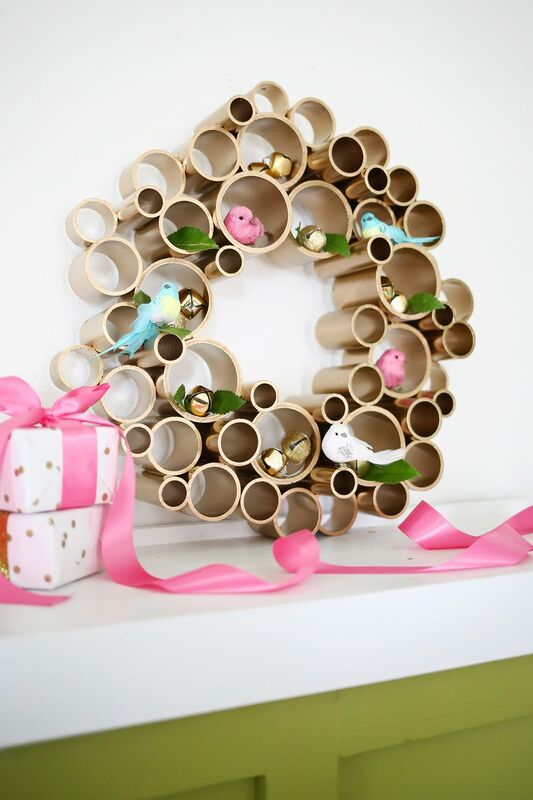 This easy DIY PVC project is an awesome modern wreath from ‘A Beautiful Mess‘. If you can use a glue gun and some spray paint, you can make this! Full tutorial with lots of photos, this is the kind of DIY home decor everyone loves! 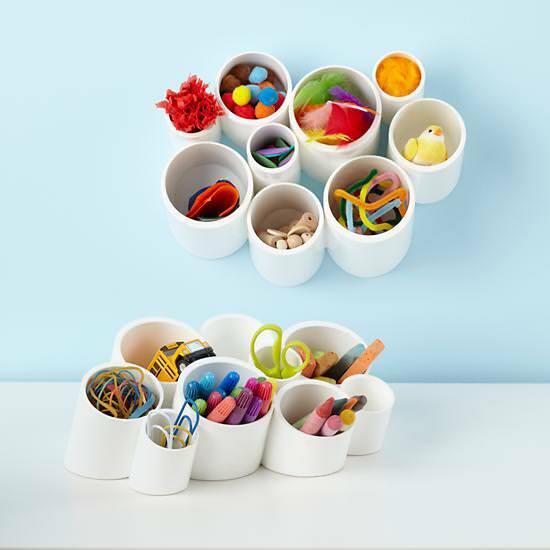 From ‘Land of Nod‘, this DIY desk or bathroom organizer is a great idea, and we knew some great blogger had thought the same thing… We were right! Jump on down to see the DIY version! 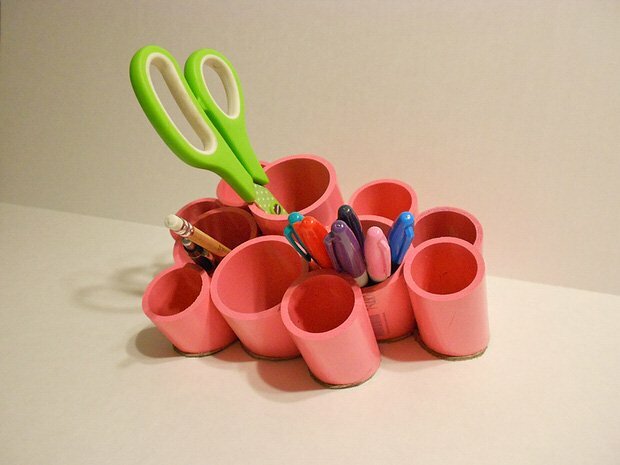 ‘Designs from Studio C‘ has done just that… a whole tutorial on how to make her desk organizer from PVC pipe… such an easy project! How about to store makeup and brushes? From Beth at ‘Home Stories A to Z‘, this DIY PVC shoe organizer is so cool because she painted it to look like logs! Cool project detail! ‘All Women Stalk‘ had this contemporary PVC cutout light that we thought was pretty cool, but the tutorial is pretty thin. While they tell you how to do the cutout with a jigsaw, I’ll tell you right now, they leave you hanging as to how to “get lamp parts”… Could you make this really simple and use mini lights inside each tube? Ideas, readers? Comment on this PVC project and share your ideas! 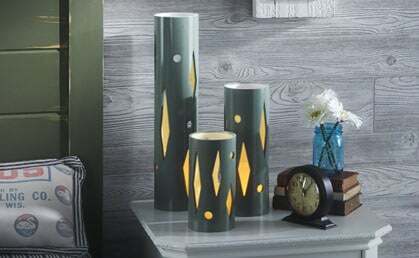 ‘Dremel Weekends‘ shows us how to make this PVC table lamp (they use a LED candle in theirs) with step by step instructions. This is an inspirational PVC project idea from ‘Sandindusa‘… No tutorial, but it is simply slices of different sized pvc pipe glued together to make a screen. We hear Liquid Nails or Gorilla Glue work pretty well for these types of projects. 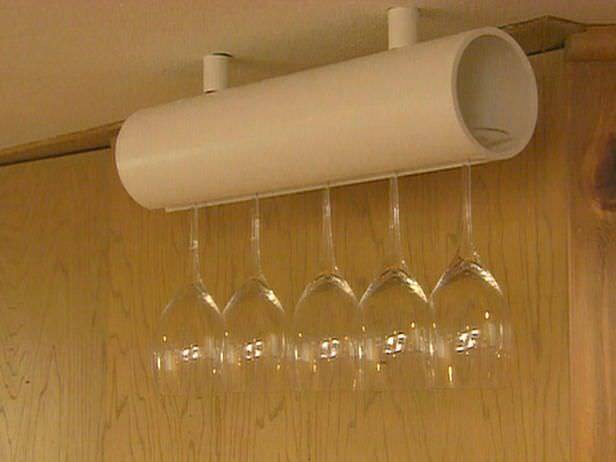 ‘HGTV‘ created this PVC wine glass holder by cutting a channel in the pipe, then hanging it upside down. ‘Ellis Belus‘ shows us how he made these clever DIY PVC bath toys… my Grandbabies would love these! You can find most of these PVC pipe fittings at Home Depot. 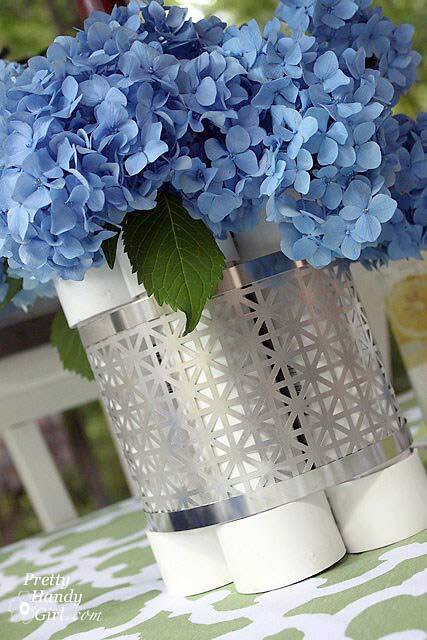 Make a modern PVC vase/centerpiece by ‘Ehow‘! Love this project, really elegant! 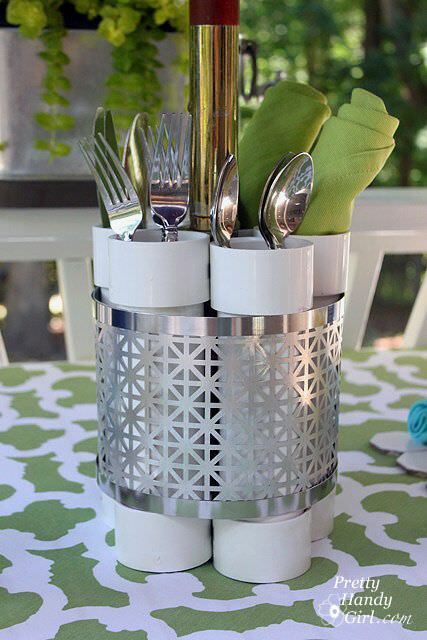 ‘Pretty Handy Girl‘ has for us a pretty handy PVC utensil holder / vase that is made from PVC pipe and metal screening. Clever! Last we have this amazing DIY chalkboard wine rack made with PVC and fiberboard. Brought to us by Apartment Therapy, the original instructions are in ReadyMade Magazine, which no longer exists… Would love to see a DIY’er try their hand at these types of DIY PVC projects! Two sections of board, cut pvc pipe sandwiched in the middle, chalkboard paint. Voila! 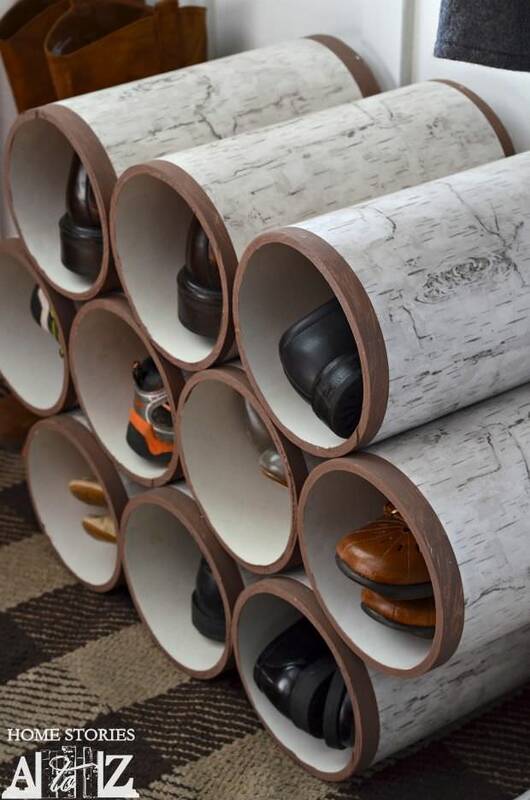 These DIY PVC Projects were really creative, and so are all the projects in our post, Creative Shoe Storage Projects. You might also enjoy our post on How To Hide Outdoor Eyesores. Note: This post has been refreshed with updated projects. I love these ideas! Living in a small space has been a compromise to live in a big city, but learning how to store and decorate is a huge plus to making that little space into a home. For maximum storage space, I have used the wine rack rails from UltraWineRacks.com, but I will definitely try out this PVC idea in the future! Nice post. I learn something totally new and challenging on sites I stumbleupon every day. It will always be exciting to read through content from other authors and practice a little something from their sites. Great ideas for the wine and shoes. I honestly don’t know what we used, but you really can just look at the piece and judge if it will fit your project… this project is really pretty simple, no need to take it too seriously! I didnt know what it was so i searched and searched until I finally found it at the hardware store so unless you want a headache the easiest way to find it is to have an employee show you but you need “wye shape” pvc pipe I think the tutorials use “wye 3×3×2 “but there are smaller and larger sizes you could use as well. Hope that helps! Wonderful ideas! Thanks for sharing. Wish I could pin these. I can’t wait to try some of these projects out! I have been eyeballing the blow dryer & straightener holder for awhile now. This is pin worthy! 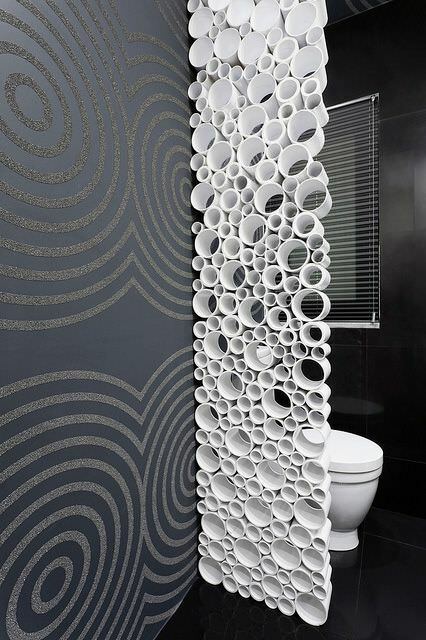 If I had to pick a fav it is the wall in the bathroom. Such an inexpensive material could be used so many ways! You just opened up a whole new craft world to me. Thanks! 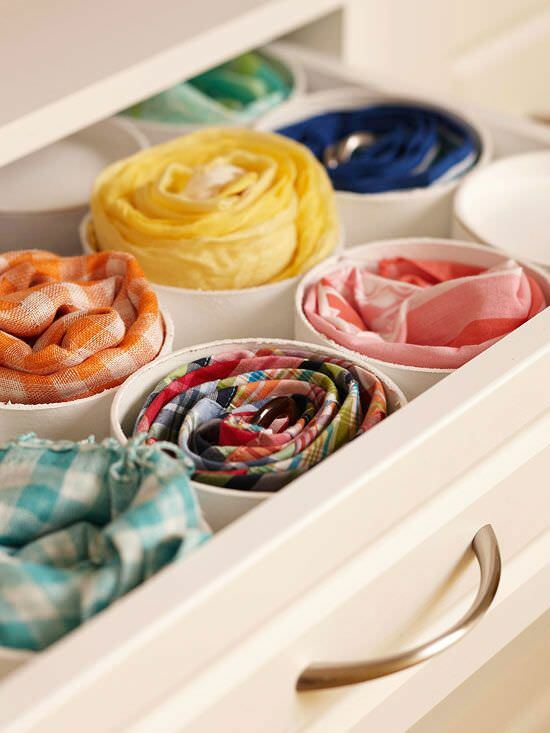 Love the ribbon storage idea! Thank you! 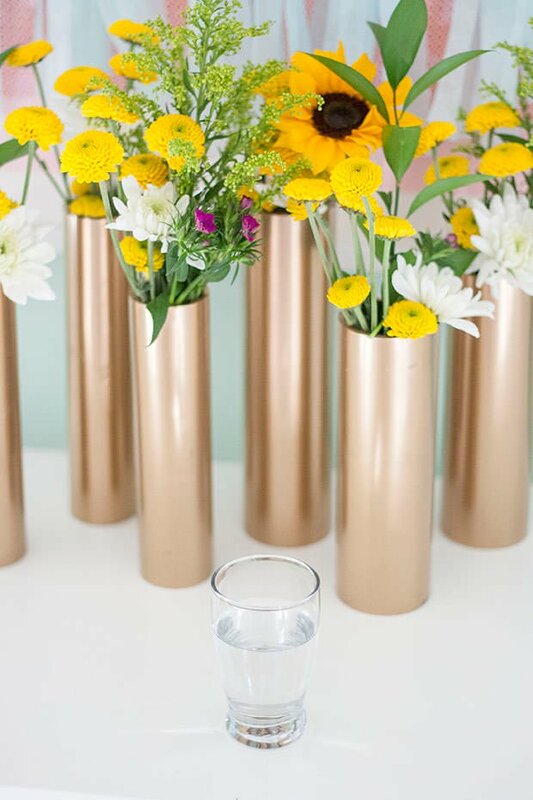 What fantastic ways to use PVC tubes. We live on a farm in northern Brazil and use a lot of it for irrigation and household plumbing. We always have offcuts, and I knew there must be a use for these. A very inspirational article, thanks. Where does one buy this ingenious contraption? For the lamp parts, I don’t see any electrical cords, so I assume the pipes are just set over battery powered light, such as this one on Amazon. I love these ideas. I saw someone else do the shoe organizer idea a while back and have wanted do it ever since. Maybe now I will finally stop procradtonating. Tanks for the inspiration! 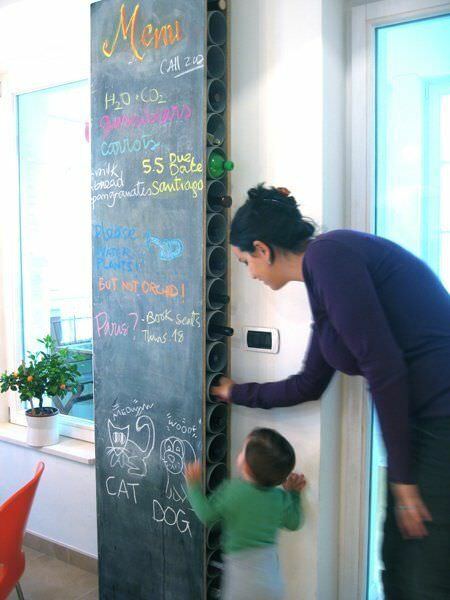 I think the chalkboard wine holder would also work for holding shoes, if the tubes are the right size, or maybe towels or other hard to stack type items. Surely some good ideas here! Thank you. Blessings! Thank you for the great ideas. I am sure going to try a few of them. I am seeing pvc in a brand new way now. On the strip lighting, be sure not to overload the power supply, paying attention to the wattage required and outputs of the supplies. For lamp parts for PVC lighting, I would highly recommend going to Amazon and search for LED strip lights. They are waterproof, use 12V DC, and.you can find 5 meter rolls of cool white or warm white for around $15. You just cut the strip to the length you want, and solder on the leads from the power supply, which you can buy from Radio Shack or possibly Wal-Mart. You can then attach the light strip using 3M VHB clear for a light that will be strictly indoors., or the 3M VHB gray tape which is made for indoor/outdoor applications. Just be certain you get the polarity right when soldering. DC projects will only work if the polarity is correct. I think if you looked long enough, you could even find the LED rolls in colors such as red, green, and blue also. You can also get 120 volt rope light, which well also need the power cable. I hope that help you DIY warriors. To add light to the inside of the lamps I’d try using LED strips. Two years ago I had an accident and I cannot walk. My husband used PVC pipe to make grab bars so I could pull myself up. He screwed them to the hardwood floors on both sides of the bed. Saved my family and aides lots of stress and I felt a little independent. I made rails for the toilet, and a chair for the tub on a pivot for my husband. When it felt iffy to hold weight, I fillied on side of the pipe with cement, until it felt stable. With those three lights, I would use an up light in the bottom. Neat ideas…but PVC is rarely cheap and NEVER free from any big boxstore like Home Depot or Lowe’s. I found an inexpensive pvc stain on eBay that actually is absorbed into the surface of the pvc, making it much more durable. Not as many color options as paint, but won’t ever flake or affect the size of your material. The seller is listed as nmc1961. “Lamp parts” can be purchased at big box home improvement stores, hobby stores and hardware stores. They usually call them lamp kits or lamp repair kits. PVC is toxic when it heats up or burns. In some states it is illegal to install pvc in a home. Although these are interesting creates, it would be far better to stay away from pvc. Who needs the extra material in their home? Hi Carol, I don’t think any of these projects would be subjected to high heat, but everyone has the right to put what they feel is safe for their family in their home! Thanks for the info! Sorry but you are incorrect. Just heating will not make them toxic. Please research before spreading you fear tactics. Actually Greenpeace says that PVC is toxic in every state, from production to disposal. There is a great debate going on about PVC. I personally avoid PVC in my home, I don’t go in the Spirit Halloween store (PVC smells terrible so it is very obvious if you walk into a room or store with a lot of PVC in it), and I do not purchase products with PVC in them. I don’t want to expose myself or my family to something that could potentially cause them harm. It is up to you to decide what you bring into your home. 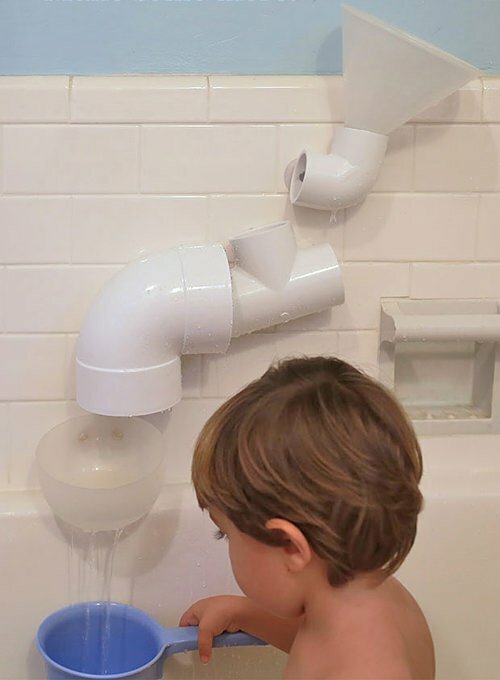 I am sorry, but I would be willing to bet, at least 9 out of 10 places your kids drink water from, has PVC pipes. If your home was built after 1990, all of the drain pipe is PVC. Thus, your home is full of PVC. my home was just built in 2015 and all the piping is pvc. Perhaps there is some confusion between PVC piping and ABS piping. ABS (the black plastic pipes) which is used for drains & vents, gives off Acrylonitrile when it is heated, which is toxic & possibly carcinogenic. PVC (the white plastic pipes) on the other hand is very common as fresh water supply piping, for potable water, swimming pools, aquariums etc, as well as for drainage. PVC is even approved for use in potable water supply in California. It seems the main health concern would be from off-gassing of the phthalate plasticizers added to the PVC to make it softer & more flexible. But, in rigid fresh water supply PVC the concentrations of these are low, and many companies are making them without phthalates. The amount of off-gassing from any of these projects, especially the hair dryer holder, would be negligible, especially compared to a vinyl floor, or particle-board cabinets. If you are unsure of the safety of PVC in your home, I would suggest to only buy pipes/fittings for fresh water supply, not DWV (drain/waste/vent), and to paint it to help seal in any potential toxins. The major spray paint manufacturers such as Rustoleum make a line of paints specifically for plastics which don’t need a primer and bond extremely well to the plastic, although the colour selection is not fantastic. Oh goodness gracious me! First world problems!! Carol and M if you don’t like PVC and are so against it then why did you click on the link in the first place. In South Africa we are just grateful if we have a pipe bringing water into our homes. Just a thought: think before you type. For the guys: make a real nice long or recurve bow from PVC. Check out backyardbowyer on YouTube. Thank you so much for all of the great ideas. 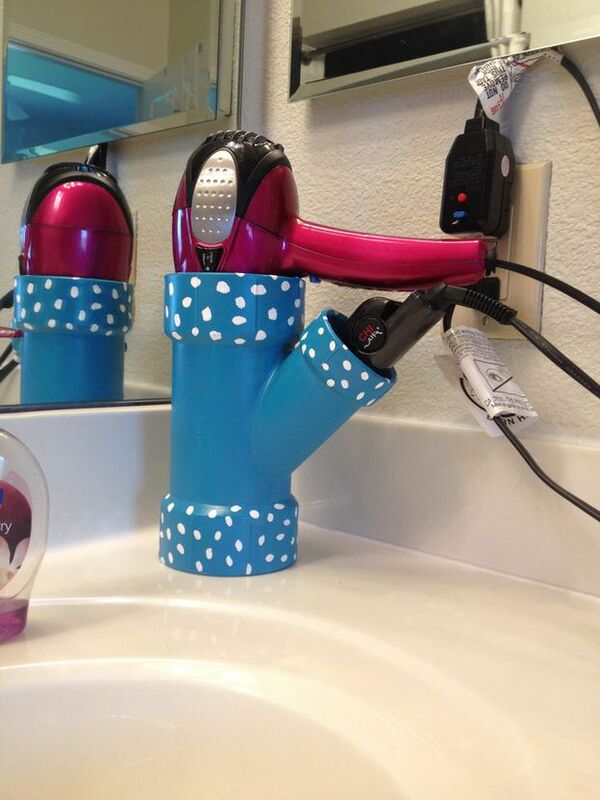 We shared the hair dryer and straightener holder on our Facebook page recently and over 2,000 people shared it! It’s such a great idea! Thanks for posting it on your facebook page! 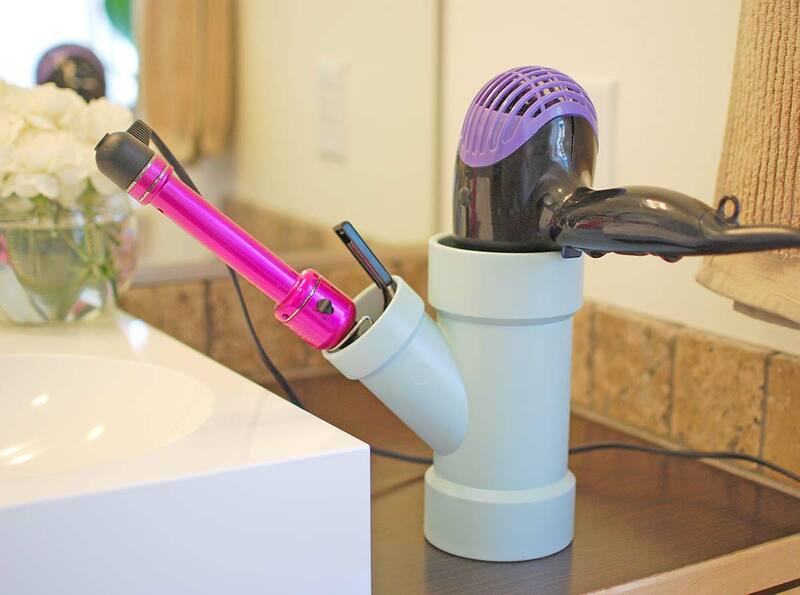 Do you need to weight down the pvc hair dryer/curling iron holder? Does it tip otherwise? command strips – I use for everything -wont damage walls – use the type for wall art – holds up to 16 lbs.- I am going to lowes now to do this. I love the idea of this and I think the velcro would work great to hold it steady. I guess a lot of it depends on the size of your hair dryer or curling iron… anyone have a fix for Debra? You can buy a flange that screws to the bottom. It is a bigger diameter and balances the pipe. I have one with 3 openings. Your local hardware carries them and can help you get the right one. You could try those 3M sticky things. They don’t ruin anything and they are easy to remove after you’re done using them. Some of them hold up to 5 pounds. Drill a holes through one side that your screw driver Wil fit through then a small pilot hole on the wall side and attach it to the wall next to the plug. Update: We went back and glued heavy fishing weights to the inside bottom of the pvc! Worked for us. I filled the bottom of the capped pipe with cement. Worked beautifully! I am not sure on the size, I think you would want it to fit your particular blow dryer, and not be too tall… Any paint that would adhere to plastic will work! Thank you! Such great ideas! Me encantaron todas las ideas!!! !